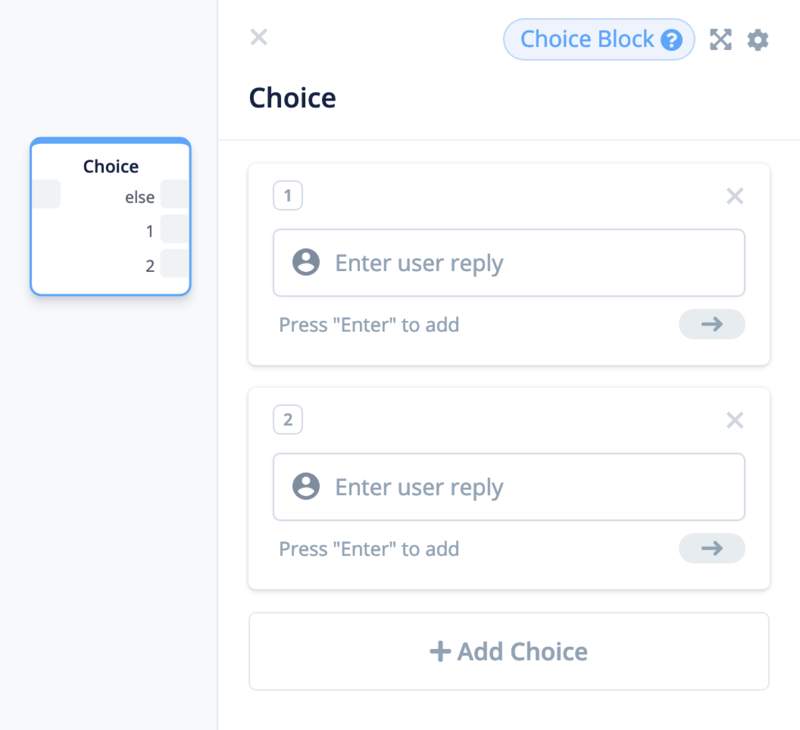 Choice blocks allow you to ask users to make a choice from a pre-defined list of choices. If the user says one of the choices listed in the choice block, it will follow THAT choice's path. 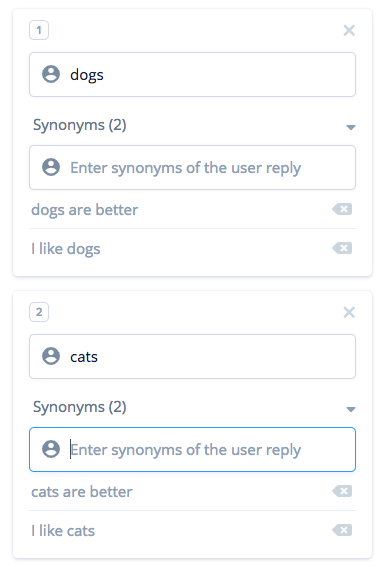 If the user says something that isn't one of the listed choices, the user will follow the ELSE path. To add choices, drag the choice block out from your block menu and click the 'add choices' button. You will see the choice block update with new block ports to connect every new choice. Not everyone with the same intention will respond the same way. To get around this, you can add synonyms to your choices. i.e. Which animal do you like better? Dogs or cats? If the user responds with something that is NOT one of the listed choice options, then the ELSE block port will be activated. For example, if the user was to say 'orange' as a response to our choice block above, it would trigger the ELSE path. This is because "orange" is not close enough to "dogs," "cats," or any of their synonyms to trigger either path. You can use the ELSE on a Choice block as an 'Error Handler.' The Error Handler will repeat the available options back to the user, and ask them to choose again. This allows you to ensure they are always choosing from the available options on the list. The Choice block is less powerful than the Interaction block. 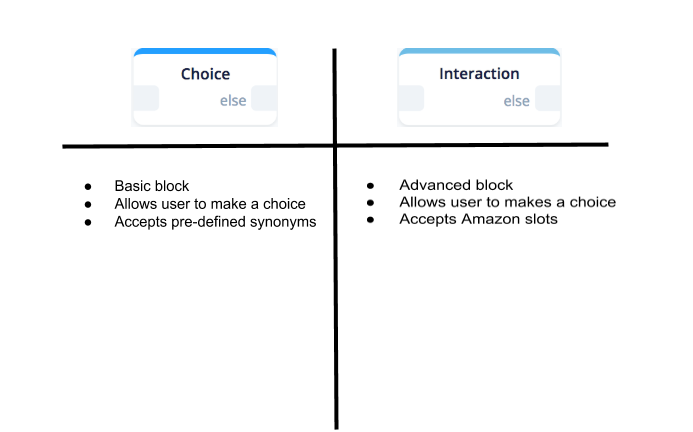 The Choice block is meant for easy choices with less variability in possible responses. Because you cannot use slots within the choice block, the block will only match the whole sentence with the correct option. 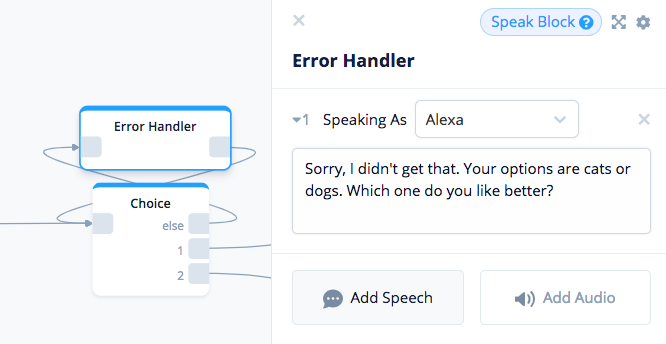 The Choice block uses Voiceflow's own natural language processing whereas the Interaction block uses Amazon's - making it more accurate.